Our credit union and bank cleaning clients stay with us a decade, on average, since our inception in 1997. The feedback we’ve gotten from these financial institutions is that our precision, matched with our low-cost, is too sweet a deal to go anywhere else. Many of our financial institution and bank cleaning clients are in Chicago’s west suburbs, including Wheaton, Glen Ellyn, and Naperville in DuPage County. Yet, we can serve the northwest and north suburbs, as well. You will have the same cleaning crew on your job every time. That way, they get to know the intricacies of your facility and become experts at it. Your crew’s person-in-charge will be responsible for any special requests you may have along the way. Don’t hesitate to ask! Another thing that makes us unique is the deep cleaning we conduct just prior to your regular cleaning beginning. This ensures your facility meets the highest standards of clean, and stays that way. 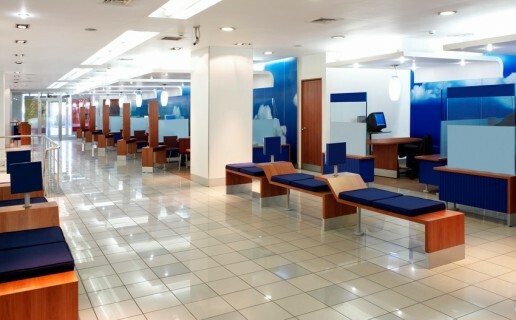 We create a custom cleaning plan for each business, as no two financial institutions are alike. Our goal is to leave you with a clean and attractive space so you can keep your employees happy, and serve your customers with confidence. For a free site visit and no-obligation cleaning quote, call 847-444-0308 or email us at info@beyondthelimitscleaning.com. For most of our new clients, we are able to reduce their cleaning costs. “A clean environment improves people’s sense of wellbeing and reduces anxiety.” ~ Richard Caines, Mintel analyst. We offer every bank cleaning client 24/7 customer support.